“Before Television” is a newsletter feature that shares the Courtenay and District Museum collection with readers. 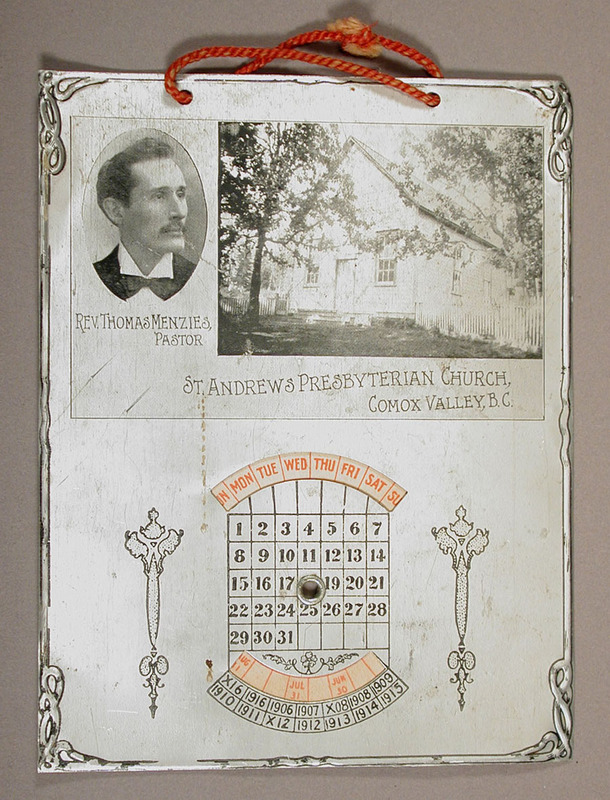 This charming artifact is a perpetual calendar affixed to a thin sheet of decorated metal. It may have been a token gift from Rev. Menzies to his congregation. Reverend Thomas Menzies (1870-1947) was a much respected figure in the Comox Valley. He came here with his family in 1900 and became pastor of St. Andrew’s Presbyterian Church in the spring of that year. An article from The Courtenay-Comox Argus of March 20, 1947 briefly summarizes some of his contributions. “He spent 22 years in the district…He represented this riding in the B.C. Legislature from 1920 to 1924. During his residence in the valley he took an active interest in all agricultural associations…Before a church was built at Comox he took services in the hall and before St. George’s was built in Courtenay services were held in the old Agricultural Hall. He was instrumental in getting both these churches built during his ministry here.”….